Regal Beloit Condenser Fan Motor, Mars 098 Series, 60 Hz Frequency, 1 Phase, 48 Frame, 825 rpm Speed, 11.69 in L x 1/2 in Dia Shaft Size, 1 Number of Speeds, +70 °F Temperature Rating, Closed Enclosure, 1.3 A, 1/4 hp, 208 to 230 V ac, B Insulation Class, Angle Mount, Ball Bearing, Reversible Rotation, Mounting Hardware Includes, 14.6 in L Vertical Outdoor Condenser Fan Motors Shaft-Up/Down. GE up/down outdoor condenser fan motors are designed for either vertical shaft-up or shaft-down applications. Shell and end shields are enclosed for weather protection. A weep hole is provided in each end shield to allow condensate to drain. A plastic plug is provided to seal the weep hole in the end shield exposed to the weather. 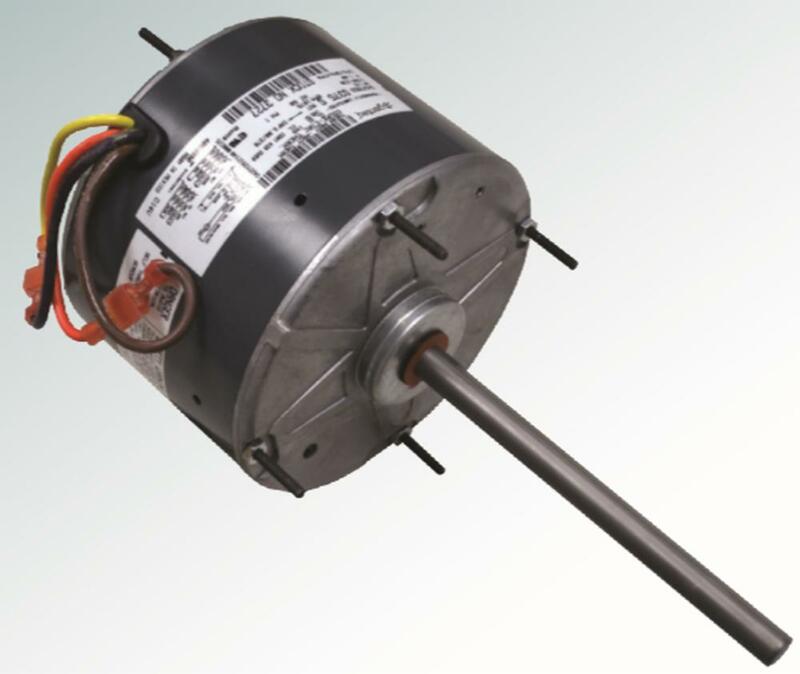 All of these motors are suitable for air conditioning or heat pump applications. All feature reversible rotation, 208-230 volts, six" shaft length and extended thru bolts extending from both ends.